A slice of this delicious Brown Sugar Banana Snack Cake with Vanilla Frosting is the perfect sweet treat for snack time or any time! 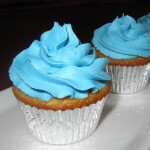 Ever since my son’s birthday last month, he has been asking and asking for me to make another batch of Vanilla Cupcakes with Buttercream Frosting. I typically only make cake and cupcakes with frosting for special occasions and birthdays. However, since the next birthday in our family is not until May, I decided to compromise and make a snack cake. 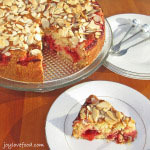 A snack cake — as loosely defined by me — is a cake with some wholesome ingredients, it may be lightly frosted and, here’s the key, can be eaten as a snack any time of day. Some Internet searching and recipe adapting, resulted in this wonderful Brown Sugar Banana Snack Cake with Vanilla Frosting. My son absolutely loves this cake, it is so delicious and I can feel good about my son having a slice because it contains wholesome bananas; and my son is delighted because he gets cake with frosting. 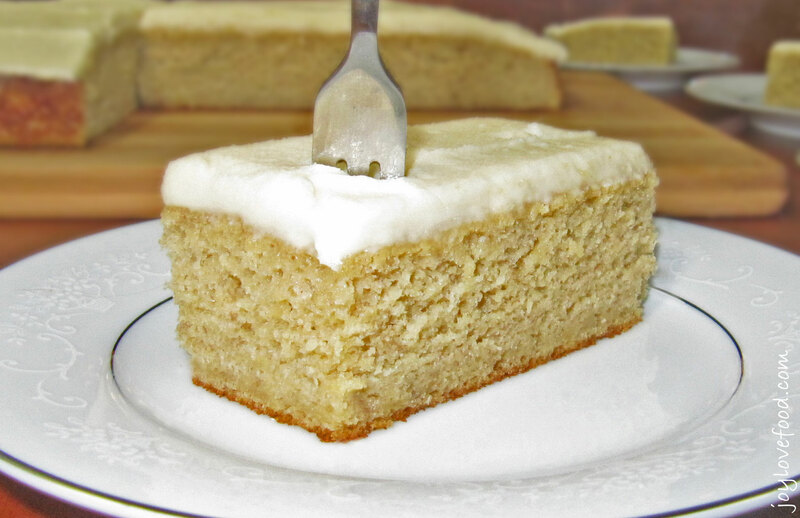 I’ve been packing a slice of this Brown Sugar Banana Snack Cake with Vanilla Frosting for my son’s snack at school; he also likes a slice for his after dinner dessert. Some family members — myself included — enjoy a little sliver along with breakfast or as a mid-morning pick-me-up. 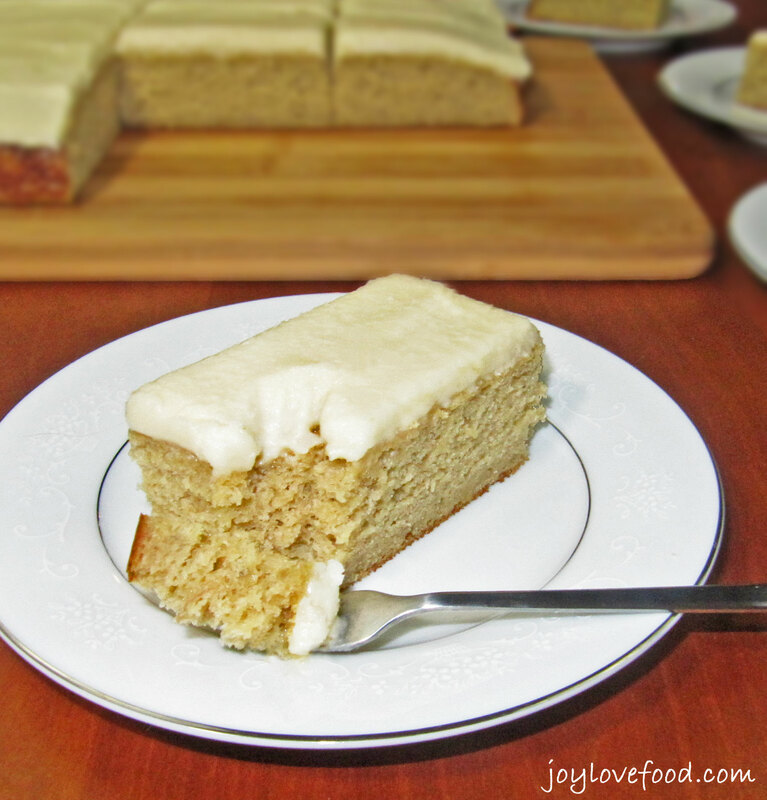 The first time I made this Brown Sugar Banana Snack Cake with Vanilla Frosting, it disappeared in a manner of days. I made it again this weekend and even managed to take a couple of photos before my kids pounced on it. I adapted this recipe from this one that I found at Butteryum. The main change I made was to use brown sugar instead of white. 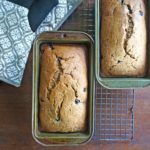 I love the richness and hint of butterscotch that brown sugar brings to baked goods, and it complements the banana nicely. 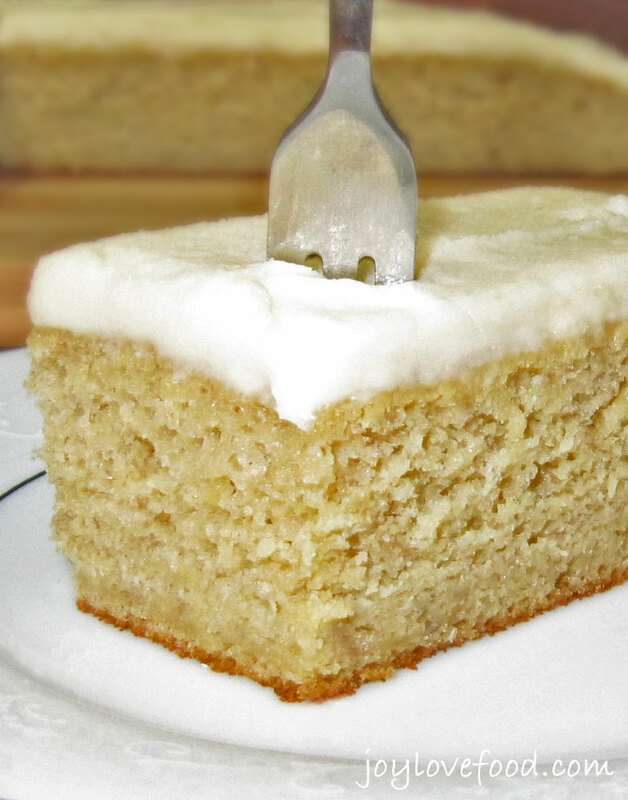 A slice of this delicious Brown Sugar Banana Snack Cake with Vanilla Frosting is the perfect treat whenever you are craving a little something sweet, as a mid-day snack or anytime! Preheat oven to 375°F. Lightly grease a 13 x 9 inch baking pan. In a large bowl, using an electric mixer, beat together brown sugar and butter on medium speed until combined. Add eggs and beat to combine. Add sour cream and beat to combine. Add in bananas and vanilla and beat on low speed to combine. In a medium bowl, wisk together flour, baking soda and salt. Add flour mixture to the egg mixture and beat on low speed to combine, scraping down sides of bowl with spatula as necessary. Pour batter into prepared baking pan, spreading into an even layer with spatula. Bake in preheated oven for 20-25 minutes or until a tester inserted into the middle of the cake comes out clean. Place pan on a wire rack and cool for 10 minutes. Run a knife along the edges of the cake to release, then invert cake onto wire rack. Cool on rack until ready to frost. In a large bowl, using an electric mixer, beat butter and powdered sugar until well combined. Add vanilla to bowl and beat to combine. Slowly add in heavy cream and beat until frosting is light and fluffy. Invert cooled cake from wire rack onto serving platter or cutting board. Frost cooled cake using a spatula or knife. 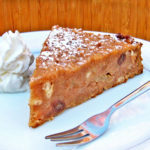 This entry was posted in Breakfast & Brunch, Cakes & Cupcakes, Desserts & Sweet Treats and tagged banana, brown sugar, cake, frosting, snack, vanilla. these banana snack cakes are right up my alley!! sooo making these! thank you for sharing this goodness – pinning!! This is sheer perfection. I love banana cake so this is right up my alley. I love when that alley is paved with brown sugar. I have to try these “Snack Cake” recipe. I like dessert recipes that have some wholesome ingredients. Love banana cake and this one looks so moist. The brown sugar is genius. Pinning to try later. This cake looks wonderful–I’d totally snack on a sliver for breakfast too. After all, bananas! I bet your son is a lucky kid at the school lunch table! Mmmm mmm I love that it’s called a snack cake so you can feel okay about eating it anytime 🙂 Looks so yummy! Hum, I missed my piece when you stopped by!! YUM this looks so good. Thanks for stopping by to link and share on The Oh My Heartsie Girl Friday Feature!! Your post has been pinned!! We appreciate you shared your blog with us!! Great post with super pictures. Made me want to pick up that fork and take a bite. YUMMMY! Yum, this looks delicious. Pinned. Thanks so much for sharing with last week’s Adorned From Above Link Party. This looks so yummy and it sounds good too! Pinning and sharing! Thanks for sharing at Totally Terrific Tuesday last week! Can’t wait to see what you have lined up this week! The brown sugar really wins me over. I tend to prefer using it over white sugar in baking. And I’m totally on board with having this for breakfast! Thanks for linking with See Ya in the Gumbo. Thanks Michelle! It is wonderful for breakfast! I like your definition – snack cake – makes me feel better about indulging in cake 🙂 Thanks for sharing at Thursday Favorite Things! Your Snack Cake looks very good! Thanks so much for sharing this awesome recipe with Full Plate Thursday. Hope you have a great weekend and come back soon! This looks perfect to go with a coffee or tea break. Yum! What a great recipe Joy!! Thanks for sharing on My 2 Favorite Things on Thursday – Link Party!! Hope you come back tomorrow and share some more!! Pinned!! Your cake looks delicious, especially with that frosting!!!!! Sounds so good!!!! I love banana cake! Your’s looks super moist and yummy! Great minds think alike! I just posted banana cake as well. 🙂 Have a great day! Perfect timing! My husband’s birthday is this week. He would love this cake! Thanks Sandra! Hope you give it a try and that you and your husband enjoy! This sounds divine and great for a treat this week. And bonus my bananas are perfectly ripe. Thanks for the idea!pinning and stumbling too! This cake looks fantastic! Yum! Looks great ! I love anything with banana ! Oooo, this looks so light and moist and delicious. The thickness of icing looks just right too. Oooh yum!. We are big banana fans in this house and I can’t wait to try this when my new oven comes in. Thanks Brandy! Hope you give it a try and enjoy! Looks good! Nice hosting with you this month! This cake looks great. I’d gladly eat it for breakfast. Boy does this look amazing!!! Banana cakes are the best and yours looks delicious!!! Oh, I can taste it now! 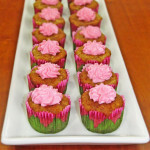 I love banana cupcakes! Yum! 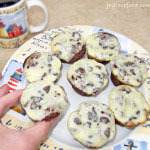 I love banana in snack cakes and this is a perfect recipe. This is one of my family’s favorites too, thanks for coming by Lily! Thanks Mila! This would be yummy with some nuts too! OMG making this today – my mouth is watering! Thanks Lizzy! Hope you enjoy it! Banana cake or banana bread…you can never go wrong! I love your definition of a snack cake! This banana cake looks amazing! This cake looks FANTASTIC ! !